The Ice Cream Barn started as two separate dreams brought together by a chance encounter. 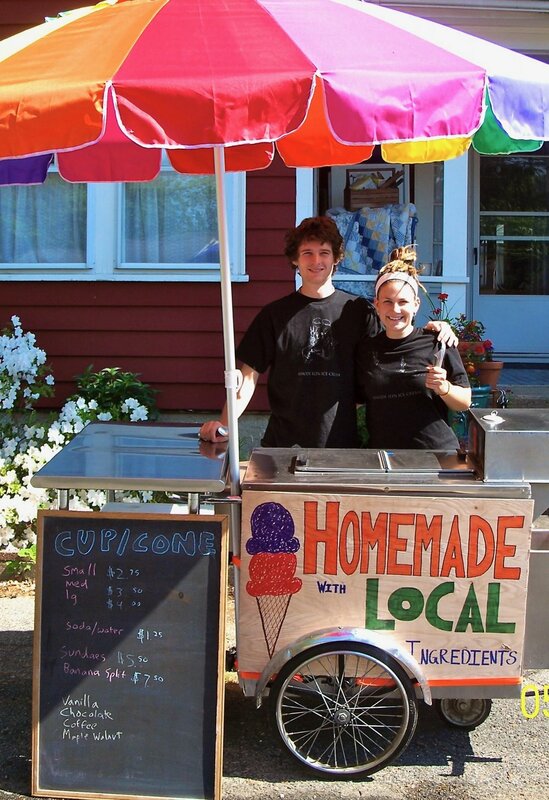 Tom and Jocelyn Seiter, both 34, began making ice cream using local ingredients and selling it to farmers markets and festivals in 2008, and dreamed of selling their exceptional fresh and delicious ice cream to as many local people as possible. Kenny Baker, 45, meanwhile, had always dreamed about selling ice cream on his farm using his own milk to make it. He had inherited his family’s farm when he was 13 years old, after his father had died unexpectedly. Kenny is the 6th generation of family who have worked hard to keep Baker Farm a viable agricultural operation instead of selling it off for housing lots. Tom, Jocelyn, and Kenny were brought together by a friend of Kenny’s, who also had become a regular customer of Tom and Jocelyn’s. This meeting would eventually materialize into the Ice Cream Barn. All of our ice cream is made fresh on site. Currently, much of the dairy produced on Baker Farm is picked up by the S.B. Winsor Dairy of Johnston, RI, where it is pasteurized, homogenized, and delivered back to the Ice Cream Barn to churn into delicious fresh ice cream. We also use other fresh locally grown ingredients to make our ice cream. Opened September 9, 2012, we have enjoyed every moment of delivering our ice cream to our customers! Thank you for visiting our website, and please come visit us in person, too.